Speeding is bad. This rule of the road has be drilled into us since we’ve begun to be conscious of what driving entailed. Except it just doesn’t apply in 7th Playground’s new game app, Speedy Pigs, where speed is the name of the game. And unlike in driving, you’re actually aiming to hit things in your way instead of swerving to miss. You are presented with five different pig characters to play as, but all characters aside from the very first one are locked until you reach a certain number of “hits.” This goes for Special Items, as well. Play in Normal, Speedy, or Extreme mode (you might want to start out in Normal first). Once the game loads, your pig character will begin running up the screen; tilt the device to move left or right. The thing you want to hit as you’re running are the Fire-Up items: blocks with flames on them. They keep your speeds up (check the status bar on the bottom), so you can actually have the momentum to hit other things in your way. Otherwise, with no speed behind you, hitting an obstacle is a game over. But as long as you’re speeding along, hit as many obstacles as you can. Hitting many in a row will earn you combo bonuses, and the longer you stay on the field, the faster you’ll be going and the higher the points given. Watch out for the bridges! Arrows will warn you a split second before they come up, and if you’re not running directly onto one, you’ll fall to your death and lose the game. Once you receive a certain number of Hits, characters and Special Items will be unlocked to give the game a little variation. The good thing about this game is that your Hits are accumulated, so you even though you keep losing, all the Hits you’ve garnered are added to a grand total. Speed is something that automatically makes something more exciting, and this game is no exception; Extreme mode hardly gives you enough time to react. It’s definitely not a hard game to play (one of those pick-up-and-play types), and until you hit at least 500 obstacles, much of the game will be the same. As simple as this game is, however, it’d be nice to have a little blurb pop-up–or even a separate instruction screen–on what you’re supposed to be doing posted somewhere. The graphics are bright, cartoony, and as outlandishly designed as the game’s concept, when you can actually get a glimpse of what you’re hitting or running past. The soundtrack is looped and not very intricate, but it does manage to convey the hurried rush this game invokes. I’m not sure how long I can be playing the same game over and over until I get something new, but if you’re a bit of a speed demon or a young child, this app just might be for you. And really, please don’t speed while driving. 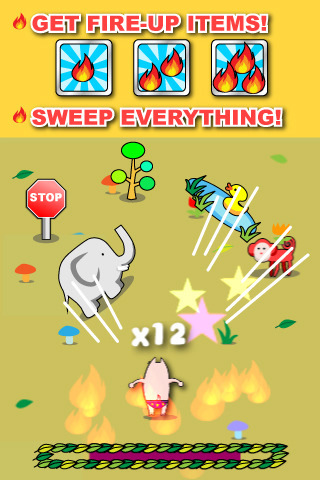 AppSafari review of Speedy Pigs was written by Julie Guan on July 22nd, 2010 and categorized under Action, App Store, Games, Physics Based. Page viewed 4431 times, 1 so far today. Need help on using these apps? Please read the Help Page. Speedy Pigs is free today!